Where do you stand on this serious issue? 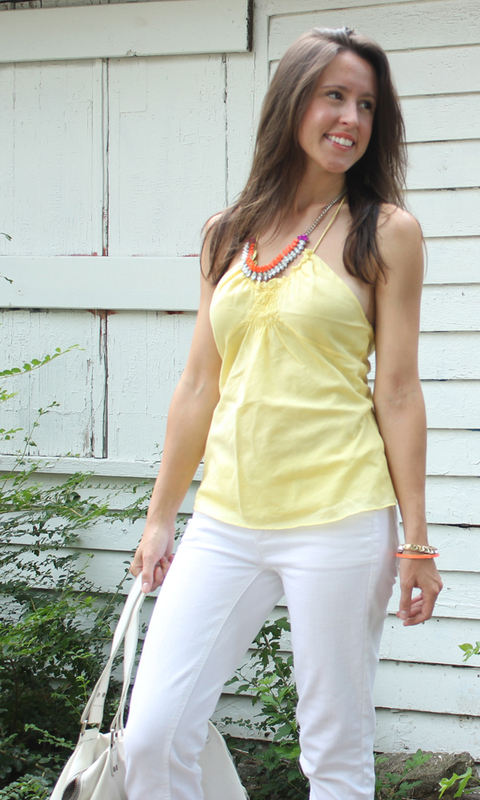 love the yellow top! and i KNOW how is it september! my favorite month - so exciting. to start a friendly relationship with your wonderful blog! I am a huge fan of crisp winter white! I'll definitely keep rocking a few key pieces!! I love your halter and necklace combination. What a great summer look!! I have never really followed the no white after Labor Day rule, but I honestly don't have that much white in my closet, so I guess it doesn't matter haha. You look SO pretty, Jessica! I love love love that STP necklace! I'm a rebel and wear white all year round :) Hope you have a great weekend! PS I'm thrilled to have you as my feature sponsor in September!! love your necklace! I am pro white after labor day! I totally wear white through all seasons. REbellll!!!! Happy Belated Birthday by the way! I don't think I own any white bags or shoes, but I definitely love white all year round. Been loving the idea of taking a white shift dress and pairing it with black tights for fall and winter. Hope you have a great Labor Day weekend lady! I agree, I will wear white, but not shoes or bags after Labor Day...and you, my friend....wow, so so so gorg in these pictures!!! First off, thank you for being one of the very few people on my bloglovin' feed NOT wearing your best fall look yet because all these blazers are just making me mad that it's too ridiculously hot out to wear them! Secondly, I love this look! I think yellow is a really pretty color on you! And to chime in, I think white can be worn year round. I don't really get why that's even a "rule" - where what you want, when you want! You are a rebel, and I like it! ooh a white shift sounds fab! I think I am warming up to yellow too! Hi dear, can you leave your website? I would love to check it out! So pretty! Love that necklace. I'll definitely be wearing white after Labor Day. Such a cute look! Love your sandals and necklace! I agree. I will totally rock my white skinny jeans or a white blazer into fall/winter, but not a white handbag or shoes. yesssss, time for MY birthday month! Glad to hear I'm not the only white jeans rocker after Labor Day! :) Love the outfit! Love the top with that necklace. Very pretty! That lipstick color looks great on you! Thanks for stopping by my blog! I say be a rebel wear white after Labor Day if you want too! :-) Besides there is a such thing as 'winter white' right? What a lovely outfit! Haha maybe I should celebrate my birthday month.. although it's only 28 days (29 on a good year :P ). As for white after Labor Day, I think that's a silly fashion rule! nice outfit! I like the soft colors! kisses! ahhhh i sooo badly want a spike the punch necklace!